The wildlife-loving public can look forward to another upmarket venue in the Kruger National Park after Concor Buildings recently completed a new three-star safari lodge at Skukuza camp. Developed by South African National Parks (SANParks), the exciting development adds a new dimension to the Kruger Park offering, slotting in between the traditional camp accommodation and the top-end private lodges. 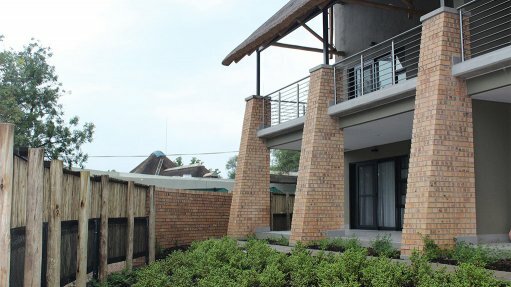 Planned and constructed as a ‘green building’, Skukuza Safari Lodge boasts 128 units, including 87 standard rooms, 20 family rooms and 13 universal rooms with easy access for wheelchairs. Facilities at the lodge include a restaurant, bar, meeting rooms, gym, pool and laundry, as well as overnight accommodation for 16 staff. With a focus on environmental care, the lodge has been designed to combine the Leadership in Energy and Environmental Design (LEED) Green Building Principles as well as the requirements of the Green Building Council South Africa (GBCSA). This meant that targets for lower energy usage as well as water savings were also built into the planning. Work began when the Concor Buildings team moved onto site in February 2017. Practical completion was reached in October 2018, and the team plans to leave site at the end of March 2019. According to Concor Buildings’ site agent, Christopher Martin, the environmental focus was taken on board by the team and applied with commitment in various ways. In line with green building requirements, the two-level structure does not protrude above tree level, minimising its visual impact. Advances in lightning protection have been harnessed, with integrated protectors being used in place of the tradition lightning poles that are very tall and generally unsightly. Even the provision of lighting is designed in a way that reduces light pollution. Water efficiency is prioritised through rainwater harvesting, grey water treatment and a dual-flush system in toilets which use recycled water. Low-e coatings on windows allow guests to enjoy unimpeded views of the natural beauty from indoors, while keeping out the heat. This, in turn, improves the energy efficiency of the building, reducing the power required for air conditioning. Innovative design also ensures that windows do not face direct sunlight. Architectural timber is a prominent feature of the lodge, with laminate saligna beams used for long-span trusses. Thatched roofing and grass ceilings add to the natural ambience, along with design elements from local cultures. While making every effort to be non-intrusive, the lodge is a substantial construction with 5,200 m2 of decking. Over 3,600 m3 of concrete has been poured over 150 tonnes of reinforced bar, and 1,8 million bricks have been laid. The coverage of roof thatching measures over 3,600 m2, while 5,000 m2 of sheeting has been used. In recognition of the authentically wild surroundings of the lodge, an important use of the concrete was in the bases of the game fence. The fence has been built all around the lodge, with substantial bases measuring in size from 1,5 m by 1,5 m to 1 m by 1 m.
The site itself presented a few challenges, with much of the infrastructure dating back many decades and not all precisely recorded in terms of location. Further investigation through radar technology and even geographic positioning systems (GPS) was sometimes necessary to identify underground services. Most services such as fresh water, grey water and sewage had to be rerouted in line with the needs of the new structures. An ongoing challenge was the distance between the site and the towns from which products and services were sourced. Being two hours from Nelspruit, for instance, added to the logistical burden and lengthened lead-times, especially considering the road speed restrictions within the Kruger Park. The movement of workers between their homes and work was also an onerous process that required careful management. While Concor Buildings exceeded the client’s brief by employing 100% of general labour from local communities, those communities could still be up to 150 km from site. Training was an important part of the project, upskilling local worker in terms of safety practice, concrete work, bricklaying, plastering and plumbing. To combat rhino poaching, security measures in the Kruger Park have had to be stepped up. These stringent measures affect the movement of everyone in the park, including construction workers. The necessary checks and procedures added to transportation cycle times but simply had to be managed by the team in a responsible way. Despite the remote location, the project was able to promote local suppliers by spending more than the required 30% of procurement value within 150 km of the site, using vendors with B-BBEE Level 3 or higher.